The Annals of the Free Church of Scotland by William Ewing is a good starting point for anyone researching any minister of the Free Church between 1843 and 1900. In this web-site we have the full text of Ewing’s Annals. Unfortunately, however, these Annals do not compare favourably in quality with the corresponding work dealing with the Church of Scotland – Fasti Ecclesiae Scoticanae. To bring Ewing’s Annals up towards that standard, we have here supplementary information, especially about the families of Free Church ministers. Hence the name of this site: ecclegen – a website which gives ecclesiastical and genealogical information in this area. This work of supplementing Ewing’s information is an ongoing task and this web-site will be updated as more information becomes available. In the course of doing this research we have gathered other relevant material. We also have here: Disruption Worthies, edited by James A. Wylie – which gives the biographies of 72 Free Church people – mostly ministers; Thomas Brown’s Annals of the Disruption, which provides much biographical information about the original Free Church ministers; and Obituaries of Free Church ministers, gleaned from The Free Church Monthly Record. Together these constitute a valuable source for researchers in this area. There has been a broadening out of the original purpose of this web-site. Researchers who use Ewing’s Annals almost certainly will also want, from time to time, to use the standard reference work on Church of Scotland ministers: Fasti Ecclesiae Scoticanae (FES). Volumes 1-7 give an account of Church of Scotland congregations and their ministers from the Reformation till the early 20th century. These are readily available on line – as indeed is Volume 8, which contains corrections and additions to the earlier volumes. But what has not been readily available, to the best of my knowledge, is a digital index of them. That’s what we have now got here – a General Index of Scottish Presbyterian Ministers, including the ministers mentioned in the Fasti, Volumes 1-8. Not only so, but this General Index includes also indexes to other similar material – the standard reference works on the ministers of the Reformed Presbyterian Church of Scotland, the Secession Churches and the Free Church of Scotland. In all the names of over 23,000 Scottish Presbyterian ministers figure in this Index. To read more about this General Index – and to access it – go to General Index in the main menu bar. Searching the standard references works manually is a time consuming business. This General Index takes the labour out of searching these basic works. It is useful both for the church historian and the family historian. Overall, this website contains not only the three classic contributions to Free Church history: Ewing’s Annals, Brown’s Annals and Wylie’s Worthies but much supplementary material besides, and all in a user-friendly format. 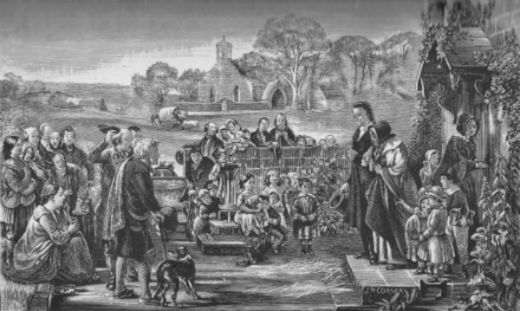 It is, therefore, a unique source of basic information regarding the ministers of the Free Church of Scotland from 1843 to 1900 and their families. Not only so, but the digital General Index of Scottish Presbyterian ministers makes this a unique place to start if you are looking for information about any Scottish Presbyterian minister from the Reformation till 1900 and beyond. For an account of how to navigate around this site, click Navigation.